Discover how these juicing recipes for weight loss will not only help you to loose weight, but will also give you all the nutritional benefits of juicing fresh fruit and vegetables. The great thing about juicing is the ingredients you need are low in calories, this is perfect for anyone who is juicing for weight loss. Certain fruits and vegetables are even said to have negative calories. Negative calorie foods are when the food requires more energy to digest than it provides. Examples of these negative calorie foods are celery, pineapple, beetroot, cantaloupe melon and many more. Here you will find out more about these foods and some great juicing recipes for weight loss. Watermelons are one of those negative calorie foods, so a perfect ingredient for use in juicing recipes for weight loss. This refreshing juice will help cool the body and cleanse your digestive system. This is a perfect drink for those long hot summer days. 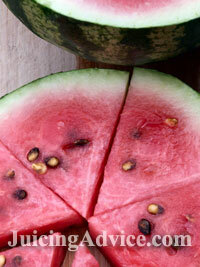 Chop up the watermelon into chunks removing the outer skin and black seeds. Place them in a large bowl and cover with the water. Leave to stand for approximately 10 minutes. Strain the watermelon and pass it through your juicer. Stir in the lime juice and sweeten to taste with the honey. If you are on a very strict calorie controlled diet leave out the honey. Pineapple is another one of those negative calorie foods. It is also very sweet so this juice should leave you with the feeling of having had the benefit of a sweet treat but without the calories. Skin and core the pineapple and cut into chunks. Roughly slice the ginger and carrot. Push all of the ingredients through your juicer and enjoy. Celery is a perfect vegetable for use in juicing recipes for weight loss as it has one of the lowest calorie content of all vegetables. This recipe combines it with sweet green grapes and watercress to give it a perfect flavour combination. Push the celery through a juicer followed by the watercress then the grapes. This recipe is ideal if your energy levels require a boost. The tantalizing combination of melon, pear and ginger will stimulate your circulation and revitalise you. I find the easiest way to get the most fruit from your melon is to slice it in half, remove the pips and scoop out all the flesh with a spoon. Quarter the pears and remove the stalk and pips. Peel the ginger and pass all the ingredients through your juicer. Get ready for it to kick you into action. Broccoli is not only another one of the negative calorie foods it is also regarded as a super food and a vital ingredient in any healthy diet. It may surprise you that it also has nearly as much calcium as milk. In this recipe it is combined with another negative calorie food the apple. 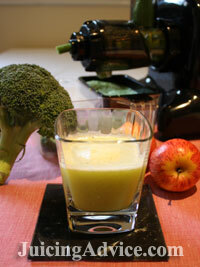 Chop up the apple and broccoli and pass through a juicer. Stir in the lemon juice and serve. Here you have a combination of 3 negative calorie vegetables: lettuce, radish and spinach. Lets face it no diet can be complete without a salad and with this you’ll be drinking it! Chop the cucumber with its skin on. Tear up the lettuce and core and chop the pears. Pass all the ingredients through a juicer. Serve onto the crushed ice and sprinkle in the sliced radishes. Want more recipe ideas? Return to our main page on juicing recipes.